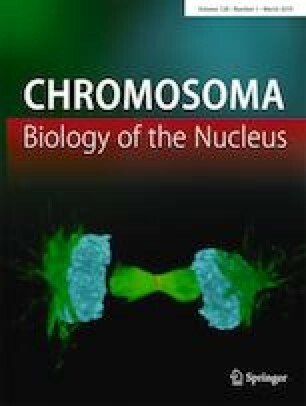 Centromeres are indispensable functional units of chromosomes. The evolutionary mechanisms underlying the rapid evolution of centromeric repeats, especially those following polyploidy, remain unknown. In this study, we isolated centromeric sequences of Brassica nigra, a model diploid progenitor (B genome) of the allopolyploid species B. juncea (AB genome) and B. carinata (BC genome) by chromatin immunoprecipitation of nucleosomes containing the centromere-specific histone CENH3. Sequence analysis detected no centromeric satellite DNAs, and most B. nigra centromeric repeats were found to originate from Tyl/copia-class retrotransposons. In cytological analyses, six of the seven analyzed repeat clusters had no FISH signals in A or C genomes of the related diploid species B. rapa and B. oleracea. Notably, five repeat clusters had FISH signals in both A and B subgenomes in the tetraploid B. juncea. In the tetraploid B. carinata, only CL23 displayed three pairs of signals in terminal or interstitial regions of the C-derived chromosome, and no evidence of colonization of CLs onto C-subgenome centromeres was found in B. carinata. This observation suggests that centromeric repeats spread and proliferated between genomes after polyploidization. CL3 and CRB are likely ancient centromeric sequences arising prior to the divergence of diploid Brassica which have detected signals across the genus. And in allotetraploids B. juncea and B. carinata, the FISH signal intensity of CL3 and CRB differed among subgenomes. We discussed possible mechanisms for centromeric repeat divergence during Brassica speciation and polyploid evolution, thus providing insights into centromeric repeat establishment and targeting. Gui-xiang Wang and Qun-yan He contributed equally to this work. The online version of this article ( https://doi.org/10.1007/s00412-019-00701-z) contains supplementary material, which is available to authorized users. Jin conceived the research and corrected this manuscript, Wang, He, and Zhao conducted cytogenetic experiments. Cai and Guo analyzed data. Zong, Han, and Liu provide and cultivate the plant materials. Wang wrote the article. This study was supported partially by grants from the Youth Science Research Foundation of Beijing Academy of Agriculture and Forestry Sciences (No. QNJJ2016) and the Natural Science Foundation of China (31000538).